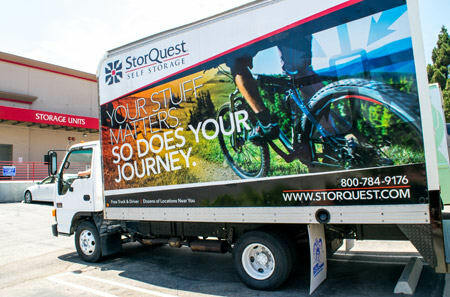 StorQuest RV and Boat Storage in Moreno Valley, CA, offers both covered and uncovered RV, boat, and auto parking spaces for rent near the Moreno Valley Freeway and Moreno Valley Ranch. Our well-maintained facility is ideal for storing your vehicles. We help you find more space in your garage or driveway. There are many reasons to store your RV, boat, or auto, but perhaps one of the most enticing is our convenient leasing package. Not only do we not require a deposit, we also offer month-to-month rentals, long-term storage discounts, and online bill pay. When storing your RV, boat, or auto, it is important that the facility you choose offers you convenient access. At StorQuest RV and Boat Storage, our Moreno Valley facility provides you with access seven days a week, from 6:00am to 10:00pm. Feel free to drop off or pick up your vehicle any day of the week - even Sundays! All of our tenants are granted a personalized access code to enter through our electronic gate. This is how we ensure that only authorized individuals are allowed on our property. For more information on the ways we make RV, boat, and auto storage more accessible for you, contact the StorQuest RV and Boat Storage leasing office today.